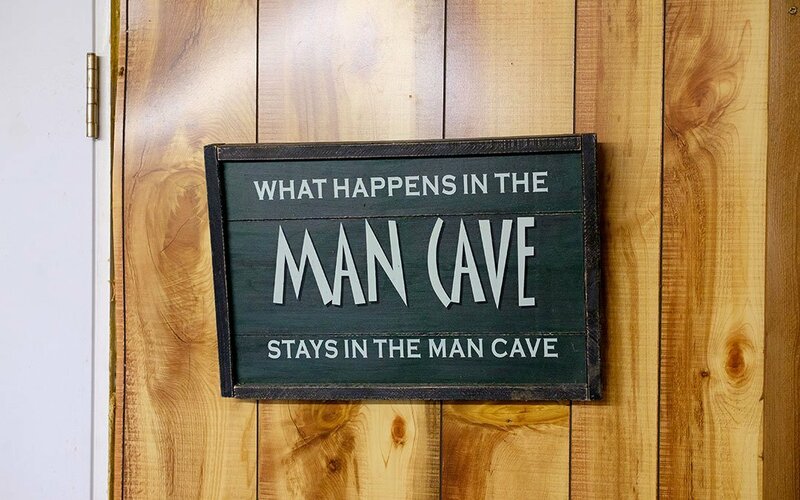 Make it “his” space: Regardless of the way in which his man cave came into being, whether it was deliberately intended or accidentally evolved, acknowledge his space and his purpose for it. With the added recognition, his pride of ownership can emerge. Now he has the opportunity to take pride in ownership, as his cave is a reflection of his personality and character. Invite him to explore man cave design options Call these “best practices,” if you wish. Like all spaces, man caves can be improved with practical design considerations that make the best use of space by enhancing comfort and increasing functionality. These designs are different from other spaces, as they appeal to one person specifically, and are not intended to cater to groups or guests. We are happy to share some of our man cave examples with him over a casual conversation in the studio. Honor his space with an occasional gift From time to time, every space needs to be refreshed. Just like any other part of the home, a new piece of art or accoutrement will create new focus on a tired living space. This whole process could be made easy with a great space analysis consultation with Cocobello Interiors. Let’s make room for all his stuff and in turn make it a space he is comfortable with.